The weekend before Rowany Festival in April 2015, I decided to make a new Norse Smokkr (i.e. apron dress) to wear for the event. As it was likely to be cold, I also decided to make a hood and a shawl to accompany the outfit. 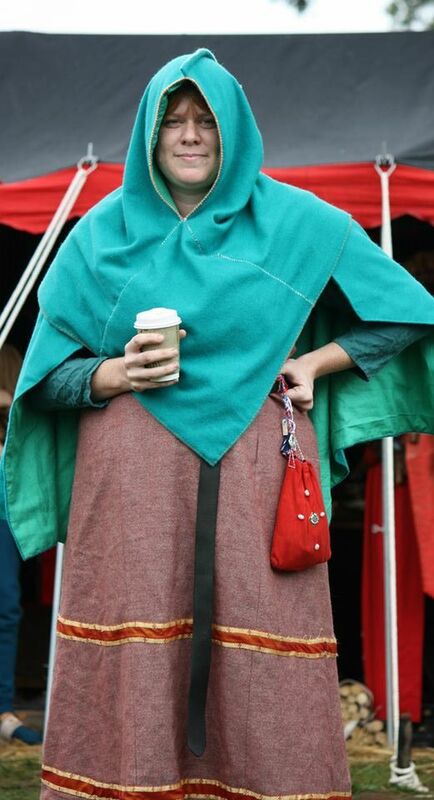 I’m in no way an expert on Norse clothing, however, I have tried to base my outfit on primary sources (where possible). Furthermore, I tried to stick to finds from Sweden to keep a consistent place of outfit – however, the hood was based on a Norweigan find. I don’t have a photo of all of the pieces together, however, I do have a photo with the hood and shawl in action (with a different Smokkr). 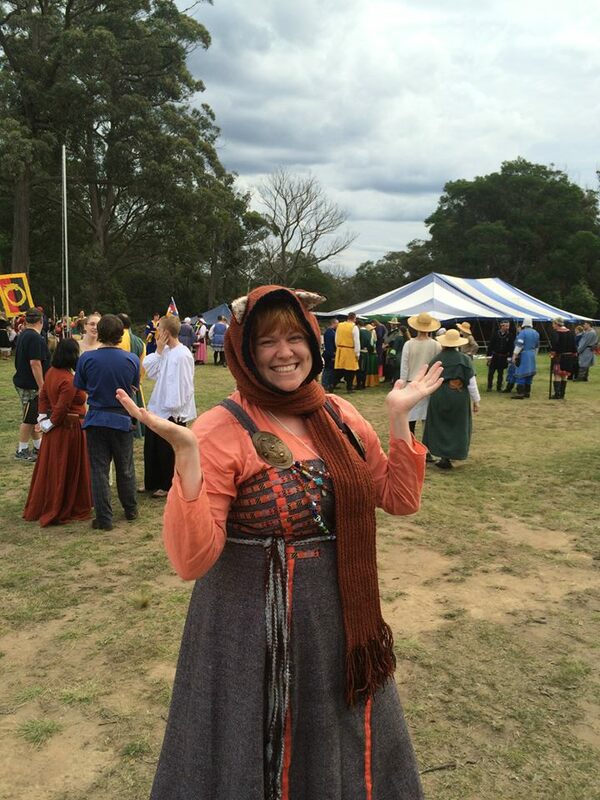 Me at Rowany Festival 2015 wearing the new shawl and hood. Photo by Duchess Constanzia Moralez y de Zamora, April 2015. Anne Stine Ingstad, author of The textiles in the Oseberg ship (last accessed April 2015), writes that silk fabrics have been found in at least 50 graves in Birka (Sweden) dated to the Viking age, probably of Norwegian origin. She also notes that similar silk fabrics were manufactured and used in Byzantium and the Middle-East in that period, which were sometimes cut up and used as decoration on otherwise plain clothing. Furthermore, silk strips are listed in the Oseberg finds. These particular silk strips had needle marks on both lengthwise sides and were likely attached to a wool fabric at some point. I searched around for interesting ideas for decorating Smokkr’s, and stumbled across an analysis by Hilde Thunem (2014) titled Viking Women: Aprondress. 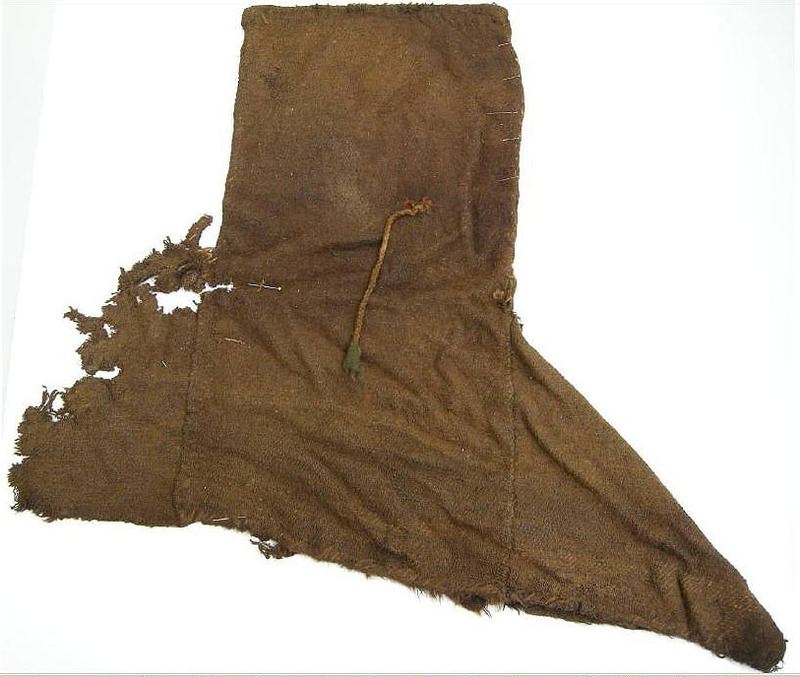 Under the information for Birka grave 735, Thunem describes how a dual grave containing a man and a woman in the Swedish town of Birka were found with an interesting textile remnant that was decorated with horizontal bands of tablet woven braid and vertical bands of silk. There is much speculation on what piece of clothing this is – it could be male or female, it could be a dress, a shirt, a jacket. One speculation is that, because the fragments appear to imply that the garment was fitted, that it could be the top of a Smokkr. The extant textile fragments from this grave can be observed on the Swedish History Museum website. I constructed my Smokkr using patterns and concepts from Ingstad’s article (2014). The body of the garment was made from wool that I won in Lochac’s Largesse Raffle for early period items at Great Northern War 2014. 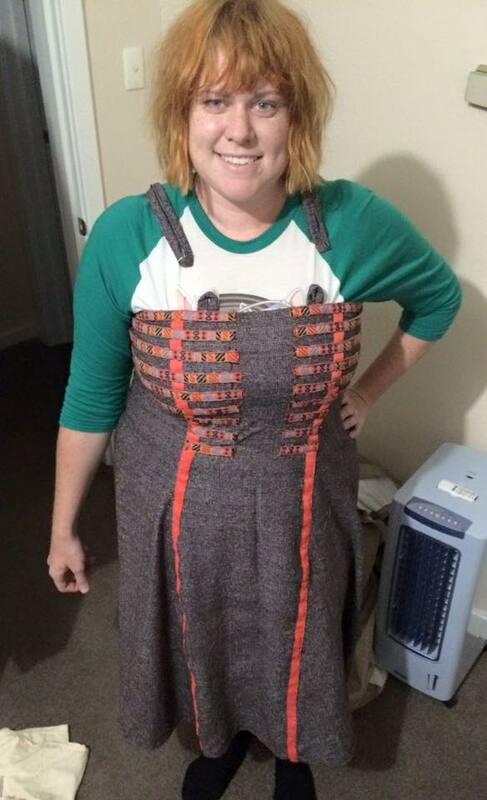 I used orange silk strips for the vertical stripes, which run down the front seams. I chose to use an orange-purple-black woven braid that I won from an embroidery competition at May Crown 2014 as the horizontal stripes. The arrangement of 6 large horizontal stripes and 3 smaller horizontal stripes that run across each side (without meeting in the middle) was mimicked from the reconstruction sketches in Ingstad’s article (2014). The use of four loops (two small ones at the front, to large ones at the back that run over the shoulders) to attach the tortoise shell brooches was also mimicked from the analysis of Smokkr loops present in Ingstad’s article (2014). Due to time constraints, I did not handsew this outfit. It is entirely machine sewn. However, if I were that way inclined in the future, there are lots of documents out there that describe the various construction stitches evident in Viking finds. For example, Stitches and Seam Techniques by Jennifer Baker (2009). Photo of Ceara Shionnach in the newly-finished Smokkr. Photo by Mum. The most clear of my photos of my new Smokkr at Rowany Festival 2015. Photo by Lord Galen. A close up of the fabric, braid (horizontal stripes) and the silk (vertical stripe along seam). Photo by Ceara Shionnach, April 2015. The shawl I made was based on an interpretation of the Sandegårda Shawl. I based it on the article called: A “Triangular” Shawl Style for the Viking Age? by Ásfríðr Úlfvíðardóttir (2010-2012). This extant shawl was dated to the 8th century in Sweden, was made of folded wool, and was likely a pentagram in shape so that it hung lowest in the middle of the back. This is similar to the Valkyrie pendants from roughly the same period, such as that from the Asynjurs. Grave find, Tuna, Alsike, Uppland, Sweden – as observed on the Swedish History Museum Flickr site. 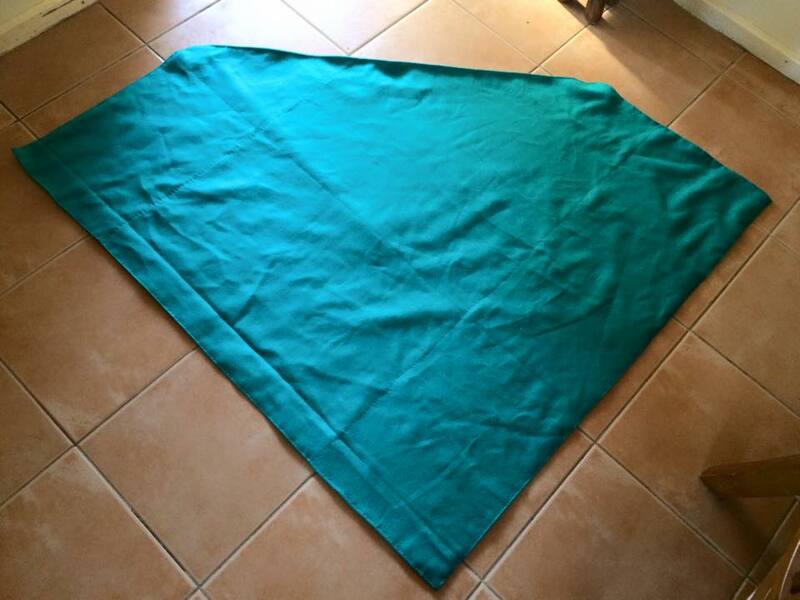 I made my shawl from green wool that I had on hand. Different from the extant find, I lined my shawl with linen to make it even warmer. 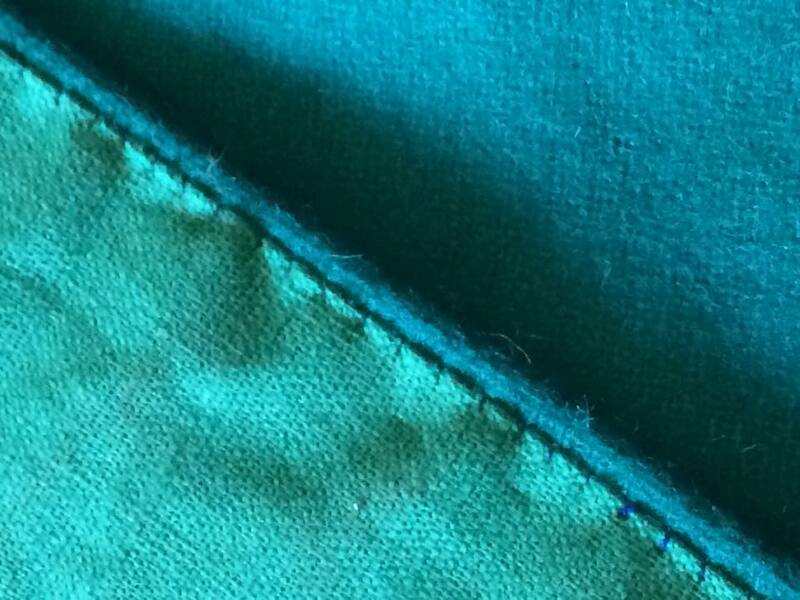 A close up of the stab-stitching that was done by hand to line the woolen shawl with linen. Photo and work by Ceara Shionnach, April 2015. The finished pentagram-shaped shawl by Ceara Shionnach, April 2015. 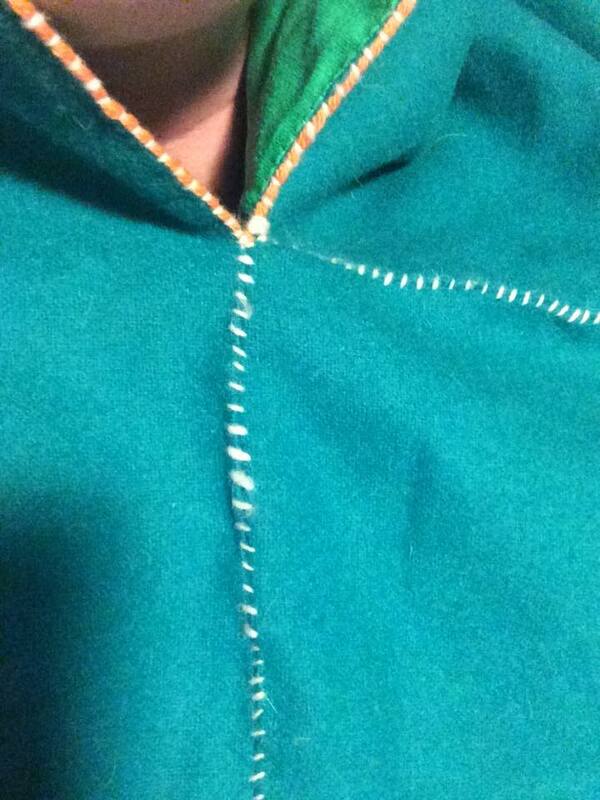 The hood I made was made of the same green wool as the shawl, and was also lined with linen to make it warmer. It was entirely handswewn using wool and, as much as possible, using the stitches of the extant Skjoldehamn Hood (Norweigan) that it was based on. This hood is based on the Norwegian Skjoldehamn hood, as described by Løvlid (2009). It was found on a body in a marsh on the island of Andøya, near the harbour of Skjold, and is dated around 1050 to 1090 (Løvlid, 2009; Deyeson, last accessed April 2015). Having made hoods for TRM Niall inn Orkneyski II and Liadan ingen Fheredaig II and hoods for Haos, Bryony and Antoinette, I knew that 60cm would not be big enough and so I extended them to 70cm for the main piece and 35cm for the gores. Unlike the extant hood, these hoods were lined with linen. This was to make them more comfortable to wear (the linen is nicer on ones face than the wool is), and would also make them even warmer and sturdier to wear. Prosjekt Fritid (last accessed March 2015) presents a diagram of the different stitches used on the Skjoldehamn hood. These include whip stitch, running stitch, blanket (buttonhole) stitch and couching. I found some aspects of the diagram difficult to decipher, however, I did my best to try and use the same stitches in the same places on the hood I made. The construction was completed using white wool thread in whip stitch to add a decorative contrast in the seams. In the extant find, however, these stitches were of a similar colour as the base fabric due to being purely constructive in nature. The cockscomb was created using running stitch in white wool stitching. The face was embroidered in couching with two different wool colours each (based on my personal heraldry) – orange and white. The bottom of the hood was embroidered in orange wool thread in buttonhole stitch (again, in the extant find this stitch was constructive and the same colour as the base fabric). I forgot to make the wool ties for my hood, however, I will add these in the future. 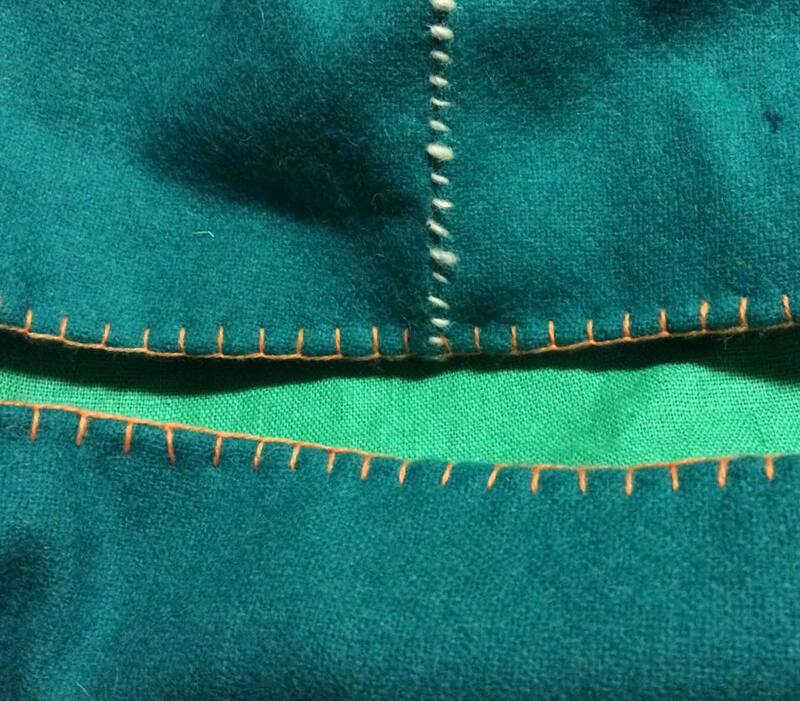 Close up of the buttonhole stitching along the bottom (in orange wool) and the whip stitch along the seams (white wool). Photo and work by Ceara Shionnach, April 2015. 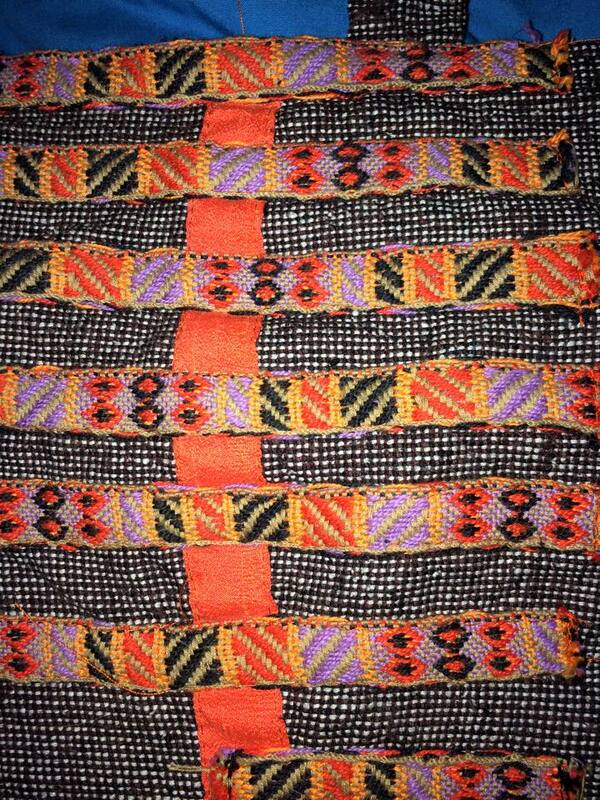 Close up of the couching around the face in orange and white wool. Photo and work by Ceara Shionnach, April 2015. Beautiful and really helpful! Thank you so much for sharing this. Your explanations and sources are wonderfully clear, as are your photographs. I am inspired!